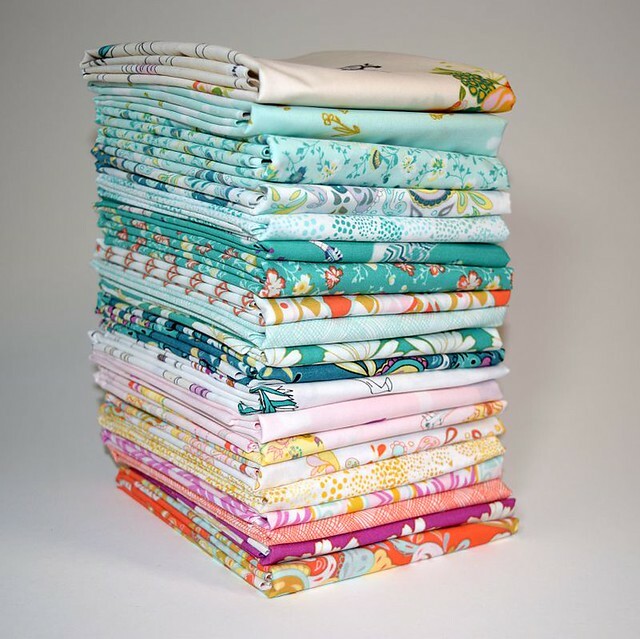 For this week's Fabric Giveaway Friday, Lady Belle Fabric is offering the winner a beautiful Fat Quarter bundle of Bari J. 's newest fabric collection for Art Gallery Fabrics, Anna Elise! This bundle will include a fat quarter cut of each of the 20 beautiful fabric prints that make up this wonderful new collection! How very generous!! You can find Anna Elise available in the Lady Belle Fabric shop as a Fat Quarter Bundle and a half yard bundle! Be sure to check out this amazing shop!! In addition, Lady Belle Fabric is offering my readers 15% OFF any order from the shop throughout this Giveaway until Tuesday August 4th, just use coupon code "SUMMER" at checkout!! That’s 4 possible entries! Enter now through Monday, August 3rd!! Winner will be picked at random and I will announce their name at the bottom of this post, here on the blog! Thank you to all who entered our Giveaway! From the 886 comment entries, this week's lucky winner is comment #788, Kath! Congratulations, I will be in touch shortly!! I love the looks of the day sail fabric. I love the blue and green fabrics. So pretty! Thanks for a fabulous Giveaway! My favorite new fabric collection is the Anna Elise. Love the colors and patterns. I am a follower on IG, Facebook and blog. :) Happy Friday! The Black & White cotton & steele bundle is pretty unique. I love the typewriter print. I never can choose faves. I love it ALL! I love the Anna Elise collection. What a generous giveaway & such beautiful fabrics! I love them all. So pretty! I love the aqua colors! Thank you for this chance, I want to attend a free quilting class in August and don't have any fabric. This would be a blessing. I follow your blog & Facebook Maureen! Loving the Emma Grace fabrics......Although all the patterns are interesting and have fun colors. I am now a Follower of your blog. I love it! I shared on facebook. Thank you so much for this opportunity. Oh, my goodness! I love almost all of the new arrivals - Anna Elise, Clementine, Daysail, Elizabeth, Fresh Cut, Paradiso, True Colors by Tula Pink, and Vintage Market are my favorites, though! What a wonderful fabric combo. Thank you, Rob and Brooke and Maureen! Love all those geometrics in Doe and Architecture. I follow you with my Blogger Feed. I follow Lady Belle Fabric on Facebook AND Instagram. I really like the Cotton Lawn from Cotton + Steel. Thanks for the chance to win! The Cotton and Steel black and white fat quarter bundle looks awesome. I've been thinking about making a quilt in black, white and greys and this would be a great bundle to start with! That pink fabric with the daisies is just lovely! I follow you on Facebook, Twitter and Instagram. Posted giveaway on facebook and Twitter. I am following you on Facebook and following your blog. I love your current giveaway! Thanks. What a gorgeous arrangement of fabrics. I love Fridays. Thanks for the lovely giveaway. I follow Lady Belle on Facebook, and am signed up to receive their newsletter. I follow you and want you to know that I'm currently (finally!!) making your Comic Book Quilt. I now follow Lady Bell on FB. That you for highlighting such a talented quilter. I love this bundle with it's modern flavor. I'm moving towards cooler colors instead of all the warm colors I've collected. What gorgeous fabrics, so hard to pick just one. Love all these designers' fabrics. What a lovely quilt these fabrics would make! I am loving the Colour Theory line! I love absolutely everything in the new arrivals... however, I must say what caught my eye was the Moon Shine Aurifil boxes. I am currently working on an EPP quilt using all three color palettes of that fabric line. I have been using bottom line thread in grey, but it sure would be nice to have some coordinating Aurifil! Great fabric bundle! I love all of the Cotton+Steel bundles on the new arrivals page and you can't go wrong with Tula Pink's True colors! oh my! so many beautiful combinations! Anna Elise is my favorite, but i love Clememtine as well! I follow you on bloglovin' and FB! i'm following Lady Belle on Facebook! Absolutely gorgeous fabric. I love the blues, and really like the large flower print. Thanks for another fabulous giveaway. I'm am a fellow full-time quilter! I use an ABM Innova 18" long arm quilting machine with no computer assist, a Janome Memory Craft 6300, and a Bernina Activa. This collection is fabulous! I love it all! Love this collection,hope I win. I liked Lady Belle Fabric's FB page. AND Tweeted! I don't normally get all crazy about a giveaway, but that fabric has my creative thoughts going wild! I love all the fabrics but the grometrics and florals are gorgeous! I follow you on feedly and IG. Beautiful fabric, and a happy Friday to you! I follow you on bloglovin, Pinterest and Facebook. Paradiso by Kate Spain is one of my favorites in the new arrivals secion. I am so IN LOVE with the Elizabeth by Tula Pink. I like the daisy print and the hashed looking prints. Thanks for sharing the giveaway! I really like Bari's new fabric line. Thank you Lady Belle. Paradiso is a new favorite of mine. Beach House Remix is beautiful! I like Winterberry by Moda. Anna Elise is actually my favorite of the new bundles (though Color Theory is a close second). Fresh Cut is my favorite new arrival - thanks. I'm a follower of yours here, on Pinterest and Facebook. You always have such fun projects to share. Those fabrics look about as much like summer and sunshine and breezes at the beach as any fabric group I have ever seen. Lovely selections. I do follow Lady Belle Fabrics on Instagram. I'm now following Lady Belle on Instagram . I have been following you for quite a while on Bloglovin'. Love your blog! My favorite is the pink With daisies! I get Lady Belle newsletter. I follow you & share on Facebook. Those are pretty prints and colors! You can't go wrong with Mini Zebras. Color Theory and Anna Elise are runners up. Great giveaway as always. Beautiful fabrics! I follow Lady Bell Fabric on facebook now, thanks to you! I'm always looking for more wonderful places to obtain a great selection of fabrics. I'm an avid follower of your blog and facebook page. Thank you for the generous Give-Away! The fabrics are beautiful. My favorites are all the turquoise blues in the bundle! I shared your facebook post of this giveaway. The colors in Anna Elise are just beautiful - I have to pick that as my favorite. And yes, I am very susceptible to marketing! 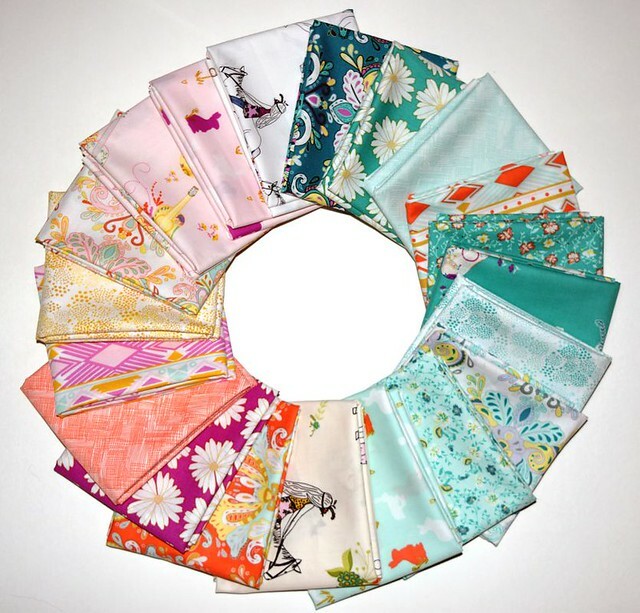 I follow Lady Belle Fabrics via Instagram! I follow you via Blogger and Instagram! I follow your blog via Bloglovin and also follow your FB page. Thanks for another amazing giveaway!! The Flower Sugar collection from Lecien is definitely catching my eye! I follow Maureen on Instagram. I am really liking what I see here with the Anna Elise, especially the very light aqua fabrics!! There are some really striking fabrics in this collection. I follow you on Facebook too. Thanks for a chance to win. I'd love a bundle of Elizabeth. Aloha Girl looks so fresh and happy. What don't I love? Color Theory and Architectures & Doe are great, but so are many others. I liked Lady Belle Fabric on FB. I've been your loyal follower for quite a while on all the social media. I followed Lady Belle on FB. I follow you on Instagram, Bloglovin', etc. Beautiful fabrics. I just love Ambleside. Thanks for the giveaway! Love them all! Thanks for the giveaway! Love the colors in Mini Zebras by Michael Miller teal/coral and zebras come on how cute. Passport from Moda caught my eye too I miss London.